Super simple 30-minute miniature cheesecake-filled orange cinnamon rolls. 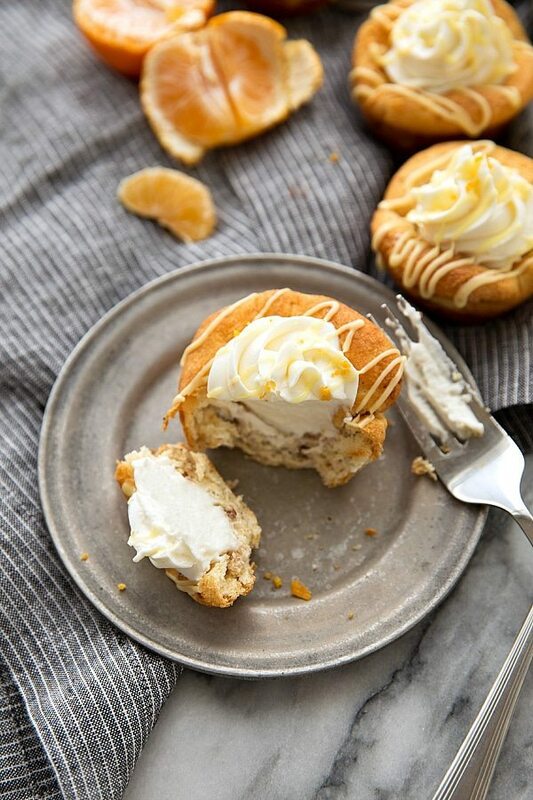 The orange rolls are baked and filled with a no-bake creamy cheesecake center. This recipe is one of my favorite inventions thus far! It’s not only fast and easy, but totally unique, and all while being DELICIOUS. A cheesecake-stuffed cinnamon roll. Crazy right?! A couple of weeks ago, I went to the store to find Pillsbury cinnamon rolls on sale. Naturally, it was time to stock up. In fact, I bought 9 canisters. ? Mostly because they were 3 for $5 so, naturally, I had to get the deal 3 times. As much as we love making homemade cinnamon rolls, we don’t get around to making them as often as cinnamon roll cravings strike. Which is at least once a week. Anyways, I found myself with NINE canisters of cinnamon rolls and decided it was time to get a little creative. Nothing too crazy, because that would totally defeat the purpose of having such an easy and delicious dessert. So, I found a fun recipe stored away on my good ole Pinterest boards from what must have been years ago. A cinnamon roll pie crust. ? Making that crust turned into the day’s project and we LOVED it. We filled the crust with lots of apples (the husband’s favorite dessert is an apple pie) and a dutch apple pie topping. Simply delicious. 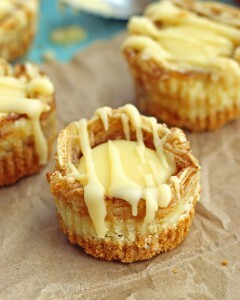 But it also got me thinking…what if I made miniature apple pies with cinnamon roll crusts. So the toddler and I totally did just that. And they were so much fun, but no where near as great as the large apple pie. So after brainstorming other types of desserts to stuff inside a miniature cinnamon roll crust, cheesecake came to mind! That is, after I finally convinced myself brownies inside of cinnamon rolls would be a no-go. At least not inside of orange cinnamon rolls. So let’s talk a minute about the ingredients and what these actually taste like! First off, the cheesecake filling is not your typical baked cheesecake. This cheesecake is more the flavor of cheesecake while having the texture of a whipped/light frosting. The filling starts with (you guessed it!) cream cheese. 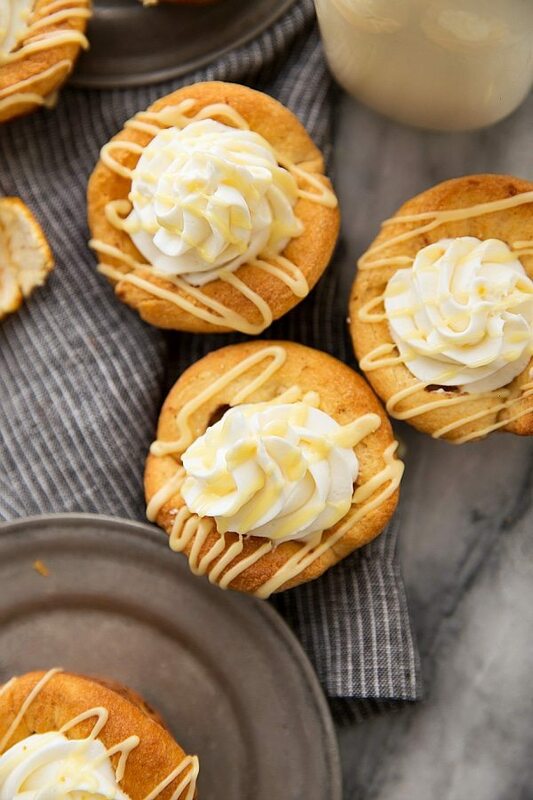 The “orange flavors” come from the pure orange extract (use a good quality for some seriously awesome flavor), vanilla extract (enhances flavor), and finely grated orange zest. You control the amount of orange flavor by how much extract and zest you put into the filling. The last ingredient is heavy whipping cream. I recommend sticking with heavy whipping cream as it’s fat content is what will allow it to hold up so well in this filling. The orange icing (that comes in the orange cinnamon roll containers) really heightens all of the delicious orange flavors when it’s drizzled on top of the filling. OR instead of piping/drizzling the orange frosting on top, you could spoon some of the orange icing into the center of each of the orange rolls right when they come out of the oven. And that’s it for the filling. Super simple, quick, and very tasty! The base is of course, the orange cinnamon rolls. 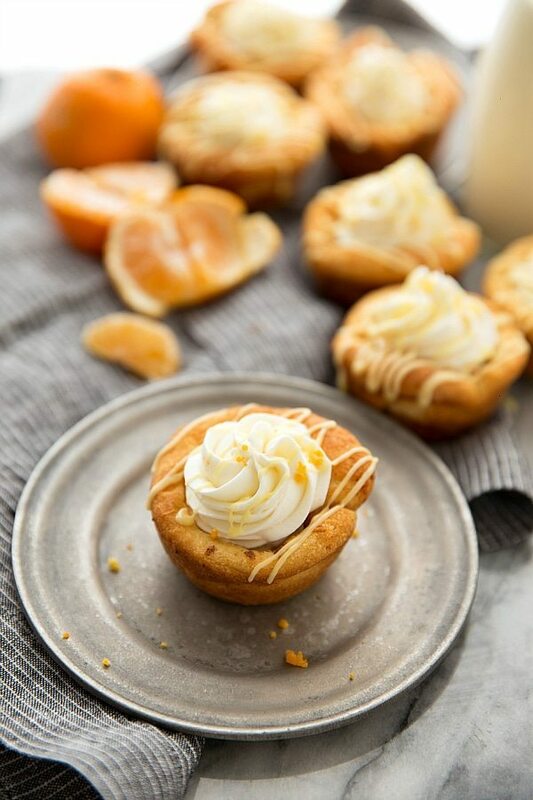 Soft-baked, zesty from the orange flavor, and with a hint of cinnamon flavor — these are awesome! Be careful to not over-bake these. You don’t want a doughy orange roll by any means, but nothing too hard and crispy either! A perfectly cooked and soft orange cinnamon roll filled with the airy cheesecake filling makes for one delicious dessert. ❤️ Or if you can somehow convince yourself it’s still breakfast (cinnamon rolls, after-all) well, then, breakfast of champions! ? Preheat the oven to 400 degrees F. Spray a regular-sized muffin tin generously with nonstick spray. Remove the orange rolls from the containers and set aside the orange icing. Separate the rolls from each other. Using a rolling pin and a lightly floured work surface, roll out each individual roll. Evenly place each rolled out orange roll into an individual cavity in the muffin tin. Bake for 9-11 minutes (My oven takes exactly 10 minutes) or until lightly golden brown on top. Be careful to not over-bake! While they are baking, beat the at room temperature cream cheese until smooth. Add in the white sugar and beat for 1-2 minutes. In another bowl, beat the cold (straight out of the fridge) heavy whipping cream until soft peaks form. Be careful to not over-beat. Using a spatula, gently fold together the whipped cream with the cream cheese mixture. Alternatively, you can spoon the filling into the orange rolls. Pipe or drizzle the reserved orange icing evenly on top of the rolls. Best enjoyed soon after being made 🙂 If you want to make these ahead of time, make the filling and store in the fridge. Roll out the orange rolls and cover in the fridge. When ready to enjoy, bake the orange rolls about 20 minutes before serving to give them 10 minutes cooking time and about 10 minutes cooling time before filling with the chilled cheesecake filling. Instead of piping/drizzling the orange frosting on top, you could spoon some of the orange icing into the center of each of the orange rolls right when they come out of the oven. Mhmmmm I love your ingenious use of pre-made cinnamon rolls + combining them with cheesecake filling! Even better with the slight citrus touch from the orange. YUM! I love these! Cheesecake and cinnamon rolls are such a heavenly hybrid. Seriously excited to make these, awesome job girl! This looks amazing! I really need to try baking with oranges! What a GREAT idea! You are clever, Chelsea! Well you made my day!!! 🙂 So happy to hear you enjoyed the recipe and the video! 🙂 Thanks!